Any extension to the Brexit transition period should come instead of – not as well as – a “backstop” for Northern Ireland, the Brexit secretary has said. Dominic Raab says this would avoid an “unacceptable” EU plan to keep Northern Ireland aligned to its rules in the event no Brexit deal was in place. Negotiators are at loggerheads over how best to avoid checks on the Irish border if no Brexit deal is struck. The 21-month transition is scheduled to end on 31 December 2020. It was designed to smooth the path between the UK leaving the EU on 29 March next year, and a new permanent relationship with the bloc coming into force. Until that transition phase ends, the UK’s relationship will remain largely the same as at present. Prime Minister Theresa May suggested last week that the period could be extended by “a matter of months” to avoid a “hard border” with the Irish Republic. However, this angered some pro-Brexit campaigners, who said it would leave Brussels with too much power in negotiations. Writing in the Sunday Telegraph, Mr Raab said there could be no “indefinite limbo inside the EU’s customs union”. But he added: “The Prime Minister has rightly refused to rule out considering different approaches – including extending the implementation period for a limited period of a few months, as an alternative to the backstop. The EU has so far refused to accept any time limit to the backstop, the name given to the contingency that would be put in place to avoid the introduction of checks on the Irish border. Meanwhile, a former Brexit minister is trying to put a legal barrier in the way of the EU’s backstop plan by requiring the approval of the Stormont Assembly. Northern Ireland’s devolved government has not sat since power-sharing collapsed in January 2017. 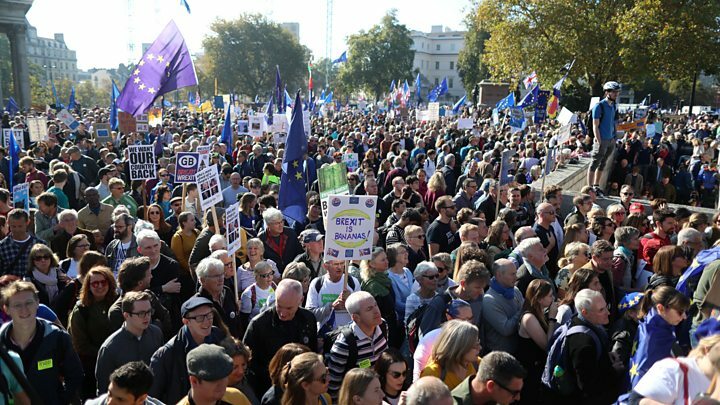 The comments come after 700,000 people were estimated to have marched through central London to demand a referendum on the final Brexit deal. Mayor of London Sadiq Khan – who started the march – was among those who addressed Parliament Square, along with representatives from the main political parties. Celebrity speakers included Steve Coogan, Delia Smith and Deborah Meaden. At the same time, former UKIP leader Nigel Farage led a pro-Brexit rally in Harrogate, North Yorkshire.